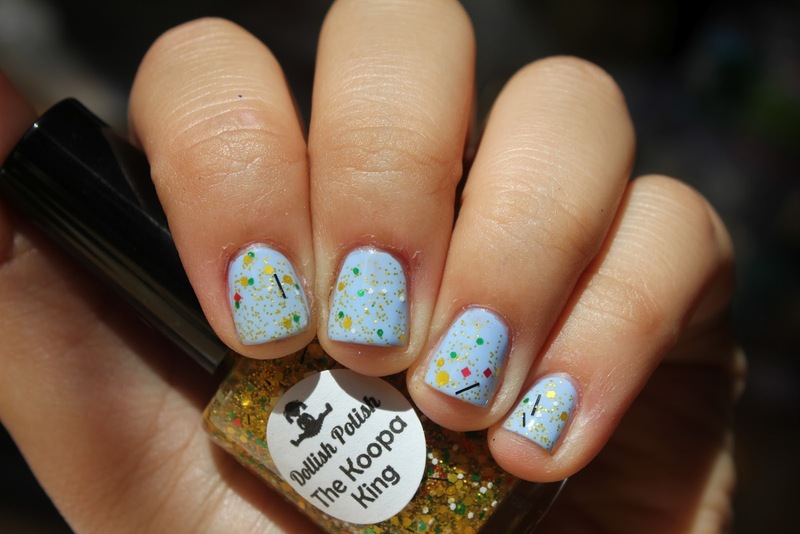 See Sarah Swatch: Dollish Polish: Koopa King! Hi all! I'll probably be still internet-less when this post goes up, but I wanted to make sure you all had something to look at:] This is the mani I wore when I moved into school, and I'm basically obsessed. I wore it for 3 days! That's quite the achievement. Here's 2 coats of Essie Bikini So Teeny with 1 coat of Dollish Polish Koopa King. I thought this was really so fun to wear. It just looks so cute! Normally, I'm not a fan of bar glitter, but it somehow really really worked in this polish. I can't wait to layer this over some more colors! While the first Dollish I tried was a disappointment, this definitely redeemed DPs for me. Great formula, and while it's not PACKED with glitter, I think the coverage was perfect for a topper. Love this glitter and it looks awesome over blue! This is an awesome combo! I'll have to try it this way. I absolutely love this polish! Very cute! This was one of the ones I wanted from this collection! I thought the idea behind this collection was so fun! 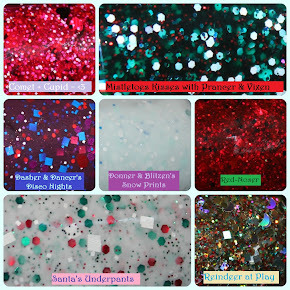 This is a really fun glitter!! Love how you paired it.